The successor to the Nikon D3300, the D3400, is considered by some to be one of the best entry-level DSLRs for the money. The D3400 was released in late 2016. 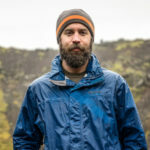 This camera usually comes with a kit lens, and while the kit lens isn’t terrible, you’ll want to expand the range and capabilities of what’s in front of your camera sensor. These are the six best lenses for the Nikon D3400. Because this is a beginner DSLR, you’re not going to find an overwhelming slate of features. It has a simple design with minimal fanfare. It does record 1080p HD movies, but this isn’t exactly its strong point. The camera takes great images, and is very easy to use. The D3400 has great battery life, is small and light, and contains sensor & processor technology found in some of Nikon’s best cameras. The 24.2 megapixel sensor will allow you to make large prints and crop your photos without losing detail. 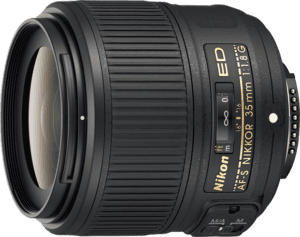 The second lens that many new D3400 owners purchase (the first being the Nikon kit lens that comes with the camera) is often a versatile mid-range zoom, like the Sigma 17-50mm f/2.8. Why Sigma and not Nikon? Sigma has earned a reputation for making quality lenses at a very affordable price for many popular camera brands. They have a great autofocus system, image stabilization, and lens coatings. And this lens has been working great for many D3400 owners. 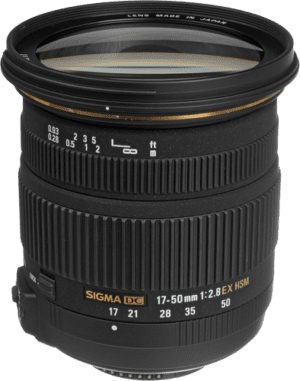 The Sigma 17-50mm f/2.8 is a very versatile lens. A constant aperture of f/2.8 and seven-bladed diaphragm will help you create great portraits. The 17mm (25.5mm APS-C equivalent) focal length will work for your landscape photos. And the small size, image stabilization, and focal range is great for an overall travel lens. Best of all, the lens is affordable. This lens is a favorite for photographers on a budget. Many reviewers agree that this is the best walk-around cheap lens available for the Nikon D3400. Photographers working with a tight budget love the value. There have been some noted issues with the focus; some reviewers have said it can be soft at wide zooms, especially towards the edges. This is a common feature of cheaper zoom lenses. Otherwise it is very sharp. The lens is heavier than it looks, and it’s definitely not a light APS-C lens at almost 20 ounces. Finally, a few photographers have noted that the zoom ring can be stiff and occasionally sticks. Some have had to send this in for repair; others have been able to get it unstuck on their own. But the inconsistency can be frustrating. Sigma’s optical stabilization can provide up to 4 stops of light for handheld shots in low light. This, combined with the fast, constant maximum aperture of f/2.8 make this a great lens for low light. The Sigma 17-50mm lens features multi-layered lens coatings that really help with color and contrast. Additional elements keep aberrations and distortion low, especially considering the relative low price of this lens. This small lens also has a fast & mostly quiet autofocus system, and the camera is capable of focusing as close as 11 inches. You’ll get some fairly decent bokeh out of this lens when using selective focus at large apertures to make your background smooth. Sigma makes this lens for many different camera mounts, and the zoom ring operates in a different direction from standard Nikon lenses. This can be frustrating to many users, and it’s a wonder why it’s not consistent. On that note, the zoom ring is also very stiff. This could help the lens from creeping, but many users have reported that it’s too stiff. This lens also has a very short throw in the focus ring. This can make fine-tuning manual focus very difficult, as the adjustment will be very touchy. Additionally, you won’t be able to override autofocus on the fly like you can with many of Nikon’s other lenses. Another basic lens that most photographers add to their kit in the early stages is a good wide-angle zoom lens. And again, the choice here is not a Nikon lens. Not that Nikon doesn’t make great lenses – they do – but there’s just so many other manufacturers out there complimenting their lineup. 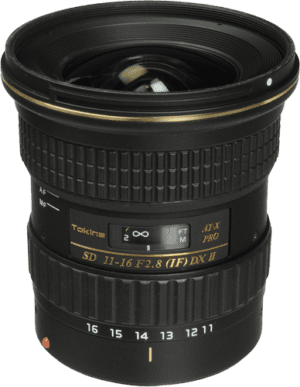 The Tokina 11-16mm f/2.8 wide zoom is a versatile lens best used in architecture, landscapes, cityscapes, and astrophotography. There is some mild barrel distortion as there is with other wide zooms, but other than that this is an easy lens to use. The lens will set you back less than $400, but the quality you’ll get out of it certainly feels like you spent more. The glass contains special coatings for improved image quality, it’s well-balanced, and produces some sharp photos. Like the Sigma 17-50mm, photographers agree that the Tokina 11-16mm is a great lens for the money spent. There are, as there usually is, a few lemons out there – but overall the lens has been very well-received. This wide-angle lens works great in many disciplines – architecture, landscape photography, and astrophotography. The f/2.8 maximum aperture really helps in low light. Distortion is minimal when this lens is used correctly. Many reviewers have noted how sharp this lens is, but there are times where pixel-peepers have mentioned the softness. When this lens is zoomed all the way out, with the aperture wide open, is when sharpness suffers the most. The sweet spot is f/8. Expect to see some shadowing from the lens hood when using the pop-up flash, especially zoomed out. This lens has some surprisingly good features for a fast, constant-aperture lens under $400. You may have never heard of Tokina, but they use the same kinds of lens coatings and specialty lens elements that increase overall image contrast and reduce aberrations and fringing. The diaphragm has nine blades, and this lens can produce some great bokeh and smooth backgrounds when the aperture is wide open. You’ll be able to focus on subjects as close as 11.8”. Tokina makes a simple clutch mechanism that allows you to switch between manual focus and autofocus very easily. You simply push or pull the focus ring to switch modes; no need to do so in the camera settings. Most of what can be improved with the lens all has to deal with the focus. The focus is, for the most part, fast and accurate, but there is always room for improvement. First, the lens may require some fine-tuning to get accurate focus. The D3400 is not equipped to do so. If you get a lens that seems to have some focus issues, you may need to send it back for another. The focus ring also has some play in it. Some photographers have said that it feels “loose”, and it can be unnerving to feel parts of your lens wobble in your hand. Finally, the focus motor is noticeably loud. It is a very affordable lens, so this is one of things you’d hope to improve on with a more expensive lens. 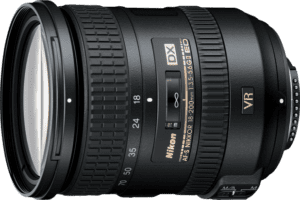 Nikon had a hit when they introduced their 18-200mm zoom lens with vibration reduction, and they’ve followed it up with a second generation. Don’t expect the optics to improve much; they were already pretty good, but it seems Nikon’s biggest improvement to this lens was the vibration reduction. Because it has a variable maximum aperture throughout the zoom range, you won’t be able to take advantage of the f/3.5 at 200mm. This is where you’ll appreciate the new vibration reduction. It is also worth noting that there are some tradeoffs when you get a zoom lens with a focal range as wide as this. Images are generally softer than other lenses, and you’ll notice some other undesirable optical qualities around the edges. But for the most part you have to really try to find the imperfections – they’re not always obvious to the casual observer. Photographers who don’t like to keep changing lenses love the Nikon 18-200mm VR II lens. The second generation of the versatile lens doesn’t come with a lot of optical improvements, but the image stabilization is notably improved. Users have noticed that the zoom tends to creep. The zoom ring is quite stiff, but this still doesn’t prevent the focal length from changing. Additionally, the vibration reduction motor is louder than it should be. Because of the zoom range, there are some compromises in image quality that photographers were expecting. Images are generally soft but can be sharpened in post, and the lens has a difficult time focusing in dark scenes. This is a great lens for beginners and enthusiasts, but some inconsistencies in performance have irked some professionals. This lens does feature a very silent focus motor, surprising given the amount of glass that it has to move. You’ll also be able to override the autofocus for the times you need a little extra precision control with the manual focus ring. The vibration reduction in this lens has improved greatly over the first generation. You’ll still only get 3.5 stops out of it – not great when compared to more expensive lenses – but still noteworthy. Nikon has always produced some great optics, and this is no exception. High-grade coatings maximize contrast. There is also little distortion and fringing apparent with this lens. Barrel locks should be standard on all long zoom lenses these days; creeping lenses can be a nuisance to photographers. Nikon’s answer to this was to make the zoom ring tighter. This doesn’t help with the barrel creep, but it’s tight enough to frustrate some photographers. Overall, it doesn’t seem that Nikon updated this lens much when they went from the first generation to the second. It seems that all that was updated was the vibration reduction. There were still some simple requests from the first generation lens that never made it to the second. Photographers who don’t have a prime lens yet often consider the Nikon 50mm f/1.8G as their first prime. It’s ideal for portraits but also works well for everyday shooting and street shooting. The wide aperture of f/1.8 will really give you a shallow depth of field and help you out in low light. Keep in mind that this is a $200 lens, so you won’t find all of the bells and whistles commonly found on more expensive lenses. These include image stabilization and weather sealing. But for regular indoor & outdoor use, this is a fine Nikon lens for portrait photography. This lens will give you an equivalent focal length of 75mm when mounted on the Nikon D3400. Photographers just getting into portraits absolutely love this lens, and it’s usually the first prime lens that many photographers purchase. Even photographers who have been doing portraits for some time have wonderful things to say about this lens. It’s a little soft at f/1.8, but the center is still sharp and that’s usually what you’ll care about. The sweet spot for sharpness occurs at around f/8. There is some more chromatic aberrations with this lens than others, but it can be removed in post processing. Bokeh isn’t perfectly round but is still acceptable, and great for a two hundred dollar lens. Pay attention to where this lens is focusing in low light. And be aware that the minimum focus distance is almost 18”; that has bitten some photographers. The Nikon 50mm if/1.8G is small and extremely light – less than a half pound. It’s one of those lenses that you can put in your bag without even noticing. It balances on the camera very well. 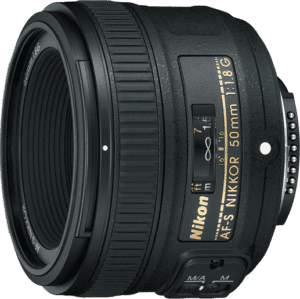 Like most other Nikon lenses, this lens features a manual override for times when you’re using autofocus but want to make small refinements with the manual focus ring. The autofocus motor is silent and focus is fast. One other nice addition to this lens, being so affordable, are the enhanced lens coatings that will improve color & contrast, reduce flaring, and minimize finger smudges. There aren’t a lot of places this lens needs to improve, given that it costs just over $200. There’s a long list of features that this lens is lacking, but those features are, for the most part, only found on much more expensive lenses. Perhaps the largest place for improvement on this lens is the sharpness at its widest aperture. Sharpness at f/1.8 is acceptable, but some photographers will find such softness counterproductive for having a lens as fast as f/1.8. If you’re looking for a lens that you can use for both macro photography and portraits, the Tokina 100mm f/2.8 is a wonderful option. When shooting macro photography, this lens will give you an honest 1:1 magnification factor. For portraits, you’ll get an equivalent 150mm focal length. You’ll probably want a tripod if you’re using this lens for Nikon macro photography. The long focal length will amplify movement; there is no image stabilization; and stopping down to at least f/4 will give you some extra sharpness. Overall, you’ll find that this lens has some great focus characteristics and produces clear, colorful images. Sharpness is competitive, if not better, than other more well-known lens manufacturers, including Nikon. Best of all, the Tokina 100mm is an affordable lens that almost any photographer should be able to add to their arsenal. 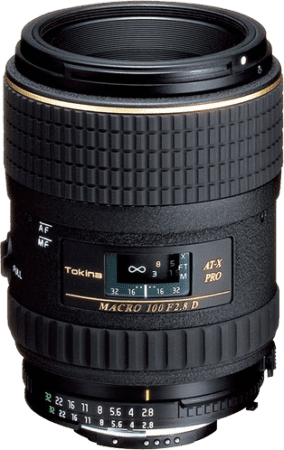 Photographers have found the Tokina 100mm f/2.8 great for both macro and portraits, for beginners and pros alike. Everyone makes note of the solid build of this lens, but they’ve found it quite heavy for a lens of this type – over one pound. You’ll note that this lens doesn’t feature any image stabilization, and most macro photographers have found that they need a tripod or travel tripod when using this for macro photography. There is some fringing in high-contrast areas around the edges of the lens. Other than that, this lens is sharper than comparable Sigma & Nikon macro lenses. Just don’t expect incredible sharpness with the aperture wide open. This affordable lens has some lens qualities that give it some outstanding contrast and clarity. A nine-bladed diaphragm will let you get some smooth, out of focus backgrounds. The minimum focusing distance is a close 11.8”, and the autofocus works very well if you’re paying attention to your focus point. Like other Tokina lenses, this one has a simple clutch mechanism allowing you to switch between autofocus and manual focus by pushing & pulling the focus ring. This lens also features a focus lockout switch. If you’re taking portraits and focusing further from the lens than you normally would for macro photography, this switch is an excellent addition. It tells the lens not to “hunt” for its subject close to the lens, instead focusing further out – helping you focus faster. The Tokina 100mm f/2.8 is slightly soft when the aperture is wide open, which means you may want to shoot at f/4. But there is no image stabilization, so you’ll most likely want a tripod. Despite all the good things said about the focus, there are also some drawbacks. The first is the noise – some photographers have likened the noise to small car engines, though this may be somewhat of an exaggeration. The focus is also very touchy, and creeps slightly, which you will mostly likely notice at wide open apertures. This is a characteristic especially detrimental for macro lenses. Nikon has always had some wonderful, fast, prime lenses, but they’ve usually been out of the financial reach of serious hobbyists or semi-professional photographers. Nikon introduced their 35mm f/1.8G DX lens for APS-C cameras, designed to make it easier for every photographer to get their hands on a fast portrait lens. The lens designed for the APS-C sensors had some flaws not found in the full-frame FX version, so it may be a good idea for D3400 owners to check out the 35mm f/1.8G FX. You don’t lose any performance with the full-frame version of this lens, and if you ever think about switching over to a full-frame camera you’ll already have this lens to use. This small, light portrait lens is fast, will give you some smooth backgrounds, focuses quickly, and you’ll be impressed with the sharpness. Photographers overall have great things to say about this lens, though there isn’t one main thing that this lens excels at. It’s good at everything, but not fantastic at any one thing. The image characteristics are good – this lens produces good tonality and contrast, focuses quickly, is sharp, and is small & light. The build feels somewhat flimsy though; the lens is mostly made of plastic and the parts are slightly loose. That, with the light weight, may make you wonder if it’s up for the job. Don’t worry, it is. This lens is more expensive than most on this list, but you will get a great value out of the purchase. Nikon has put some excellent optics in this lens. It features an extra low dispersion element to reduce aberrations and high-quality lens coatings to increase clarity and improve color rendering. This lens can focus in pretty close too – down to 9.8”. Focus is quick thanks to the focus design that only moves the rear elements to focus, meaning the motor has to work less. If you like to use manual focus, or have a manual override, you’ll love the super large manual focus ring. There aren’t a lot of things to improve with this lens, given the quality of optics for the price. It would seem that a lot of the money savings went into the body; if this lens were made of metal or even a tighter plastic build, it’d put some more confidence in the photographers holding it. As far as weaknesses go, there is a bit more vignetting with this lens. This can be fixed in post-processing but is just another step you’ll have to complete. 100mm tokina f2.8 is a great macro lens. I use it on my D7200, but on my D3400 it is pretty much useless, no autofocus, no metering and I am unable to alter aperture in-camera. These things pretty much make it incompatible with a D3400. If you have a work around would love to know about it.